Free Membership to Red Sox Kids Nation with Free Red Sox Tickets and More! Do your kids love the Boston Red Sox? You may want to sign them up for Red Sox Kid Nation which is the official kid fan club of the Boston Red Sox. Red Sox Nation is recommended for children 14 and under. There’s a bunch of different perks of being a member of Red Sox Kid Nation including a FREE Red Sox ticket per member while supplies last. You should receive an e-mail with a link that enables you to claim your free tickets and follow the instruction to order your tickets! Keep in mind that all sales are final with no refunds or exchanges issued on the tickets. 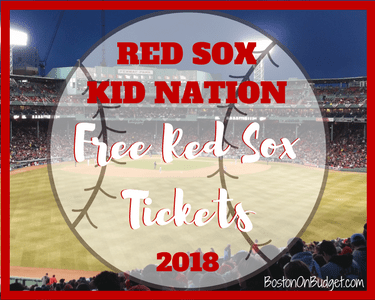 There are also other perks to Kid Nation members such as the passport program, access to exclusive events, 10% discount to the official Red Sox store and more! There is also a paid membership (All-Star member) where you can get Red Sox gear and more perks for $39.95, but it is optional. The Rookie membership is free and you still get a lot of great perks! If you have any questions about Red Sox Kid Nation, head to their FAQ page here. For more information or to sign up for Red Sox Kid Nation, please head here. Have you or your child signed up for Red Sox Kid Nation in the past? Are you or your kid signing up this year?